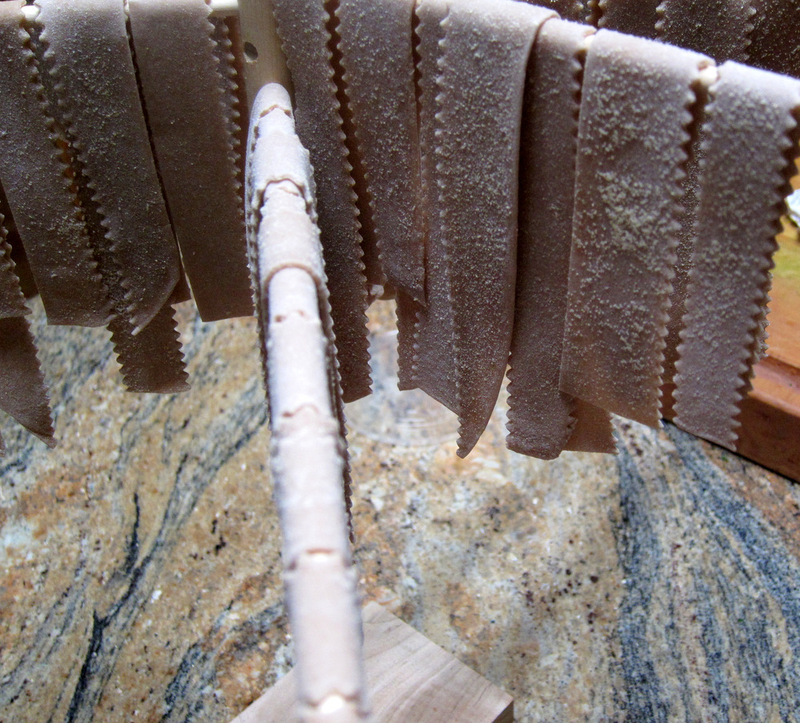 It’s been a while since I posted about a homemade pasta on these pages. Not because I have not made any but the majority is stuff I’ve posted about before or similar to what I’ve posted about before. Well, here comes something I made recently and was so sublime that I had to post about. 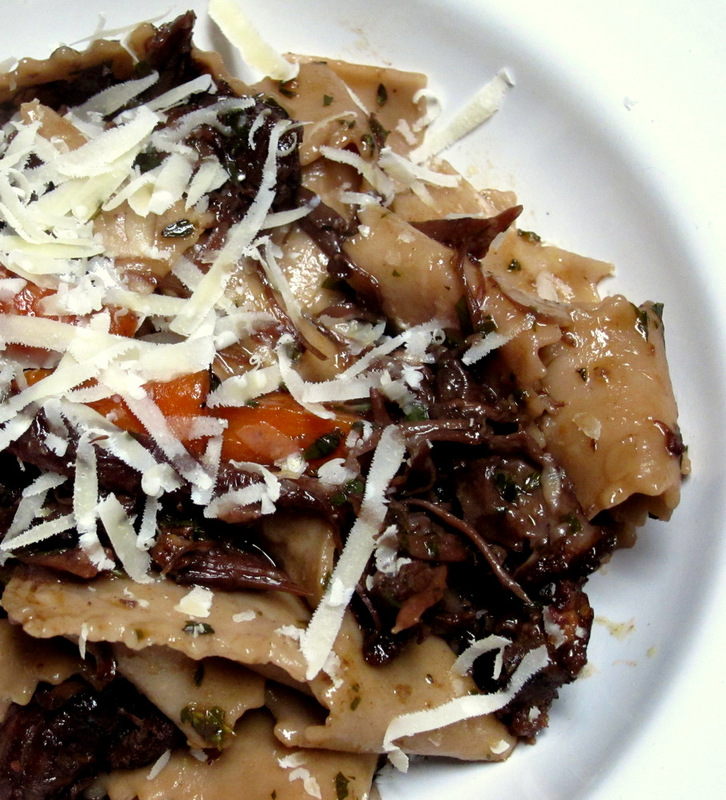 The blue print is really a traditional dish of fresh pasta and braised meat. The emphasis is on bold flavors with a recipe courtesy of the book Collards and Carbonara from Andy Ticer and Michael Hudman. It’s a perfect title for a book where the authors put their American south spin on Italian flavors. 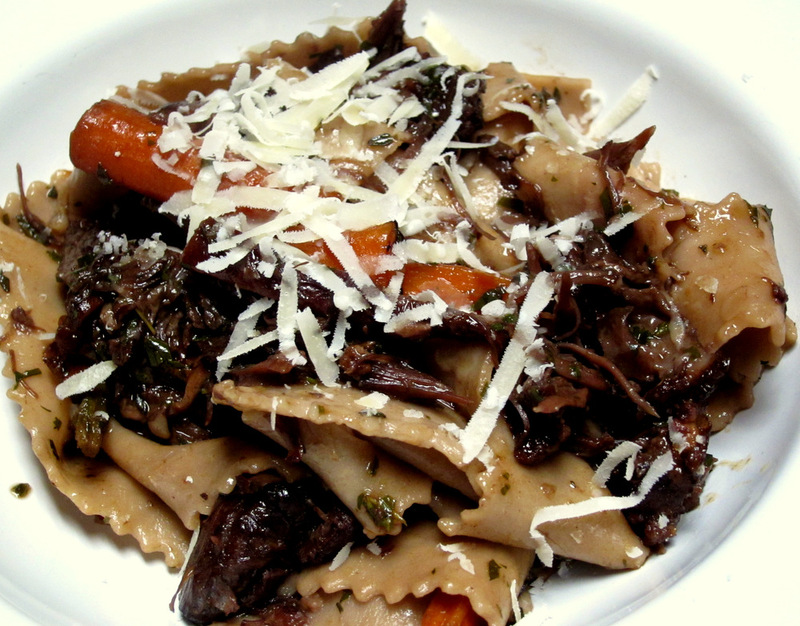 This is a hearty dish with lots of red wine. It is everywhere. The pasta is actually made from eggs with a good helping of red wine – almost half egg and half red wine. The end result is not so much red as brownish. 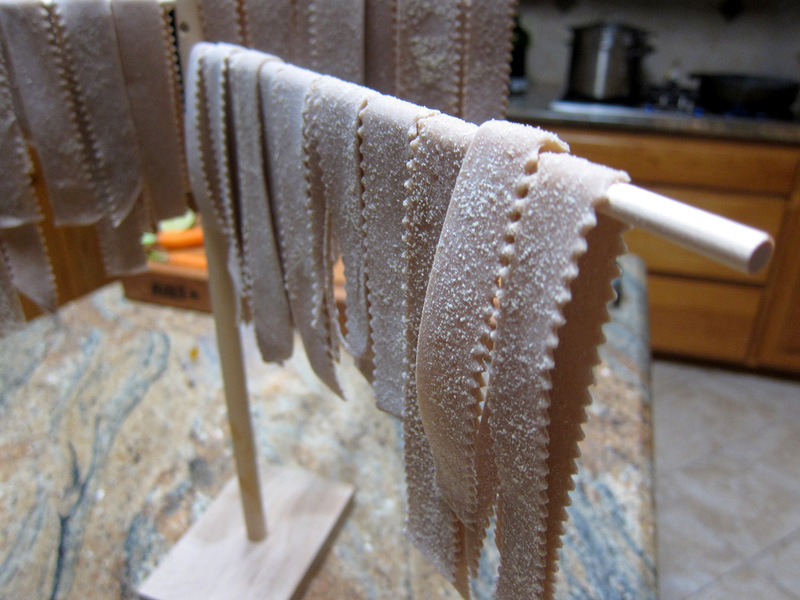 What I really loved about the pasta is the thickness. Instead of rolling them relatively thin as usual, the authors instruct us to roll them to the 4 setting on the pasta machine. This results in noodles that are relatively thick. I honestly had my doubts here but I figured I’ll give them a go and see what happens. I should not have worried. 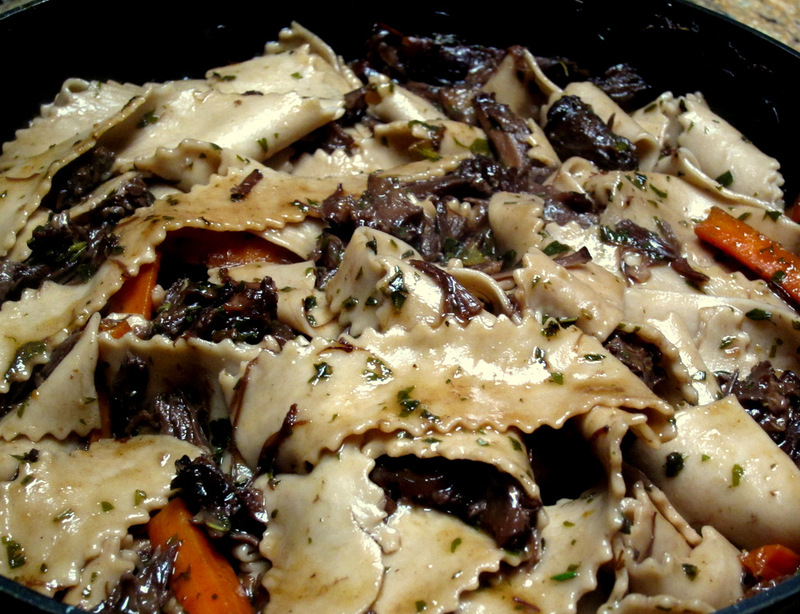 The cooked noodles were the perfect foil to the rich hearty oxtail stew. They had a lovely texture to them that is equally soft, substantial and chewy. I started the oxtails basically a week before by making a beef demi glace. I prepared a big batch of beef stock in my pressure cooker and allowed it to sit in the fridge until the fat solidified. I removed that and reduced the stock with more aromatics (shallots, thyme, black pepper) and red wine until I got about a pint of the most amazing beef reduction. The stew is pretty straightforward. 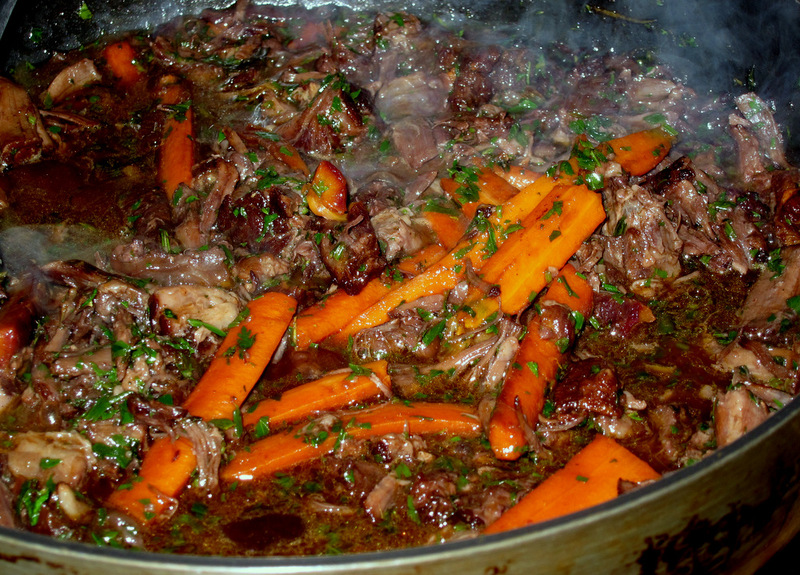 Brown the meat and cook it for a long time with some garlic, mirepoix, a whole bottle of red wine, the demi glace and water. When the meat is fall off the bone tender it is removed and picked from the bone. The cooking liquid is reduced and strained. The meat and cooking liquid are stored separately. Again, this is an important detail that I think makes the recipe much better during the finishing steps. Meanwhile I prepared a mix of small purple and orange carrots by cooking them sous vide bagged with butter at 85 C. They were cooked till tender but remained firm and retained a nice color. To bring it all together while the water came to a boil for the pasta, I sautéed the halved carrots in oil until slightly charred. To that I added the oxtail meat and browned slightly, then a whole lot of chopped herbs (rosemary, parsley, thyme) and more red wine and allowed that to reduce. In went the reserved braising liquid and the whole thing reduced slightly to get a nice consistency. I tossed in the freshly cooked pasta and some splashes of the boiling water and served. It was a really comforting, rich and beautiful bowl of pasta. The handfuls of fresh herbs in there brought a fresh and bright note to the bold flavors. That whole was perfect for the cold weather we had been getting and the leftovers were just as good.